Nasrin Sotoudeh’s husband, Reza Khandan on day 41 of her hunger strike warns about the seriousness of her grave condition. Nasrin’s husband explains, “Yesterday Nasrin was taken to the medical clinic at Evin, and from now on they intend to take her to the clinic everyday. Her blood pressure was so low that the person taking her pressure could not read it and couldn’t tell her what her pressure was. The Judicial officials can go on denying everything, but truth always will prevail and will collapse on those who pretend ignorance. Nasrin Sotoudeh, a lawyer and human rights activist, launched a hunger strike on October 17, 2012, protesting pressures put on her family; banning her 12 year old daughter from leaving the country, denial of the right for her mother to visit her in prison over the past year, denial of in-person visits with her husband and children, and denial of use of a telephone. Despite requests from friends and various political and civil activists urging her to halt her hunger strike, she Insists on continuing her hunger strike and is now in a dangerous physical situations. Not being sent to the hospital in time has caused hearing loss in the left ear of imprisoned lawyer Omid Behroozi, a member of the Gonabadi Dervishes. This political prisoner has been imprisoned in Evin Ward 350 for fifteen months without being tried, is suffering from arthritis in his 5th and 6th vertebra and ear aches caused by blows to the head and neck during his arrest. Due to the harsh conditions of Evin Ward 240 solitary confinement, and the cold damp cells, his condition has worsened. Behroozi was incarcerated in solitary confinement at Ward 240 for sixty days and the officials ignored his pleas regarding his health condition. They even refused to deliver blankets to him. This inattention to his condition has caused damage to the auditory nerve in his left ear. It is noteworthy that after repeated requests for treatment, he was examined by doctors at Taleghani hospital and was told his condition can easily be treated by medication such as Cortone. Afshin Karampour, Farshid Yadollahi and Amir Aslani are the other Gonabadi Dervishes lawyers that are held in Ward 350 that are deprived of needed medical treatment and attention. Farshid Yadollahi has been waiting 13 months to receive dental treatment, and has been waiting 5 months to be sent to hospital for surgery. Amir Aslani was sent to Masih Daneshvar hospital in September for treatment of a heart condition but due to prison officials refusing to pay for the cost, he did not receive treatment and has been suffering with heart condition for three months. For over a year, Afshin Karampour has lost his mobility due to a torn tendon in his leg and is suffering in Ward 350 without ever having been tried. Eleven Baha’is tried last month by the Mashhad Revolutionary Court on charges of Propagating Against the Establishment, were convicted by presiding Judge Ghorbani and have each been sentenced to six months imprisonment. Also, Horiyeh Mohseni Negar Malekzadeh and Negin Ahmadian were fined 300,000 Tomans for possession of satellite dish and accessories. After several weeks of being banned from visits, Reza Khandan was permitted to have a cabin visit with his wife Nasrin Sotoudeh. Nasrin’s husband Reza Khandan has written a post on his Facebook page about this visit, “She has lost a lot of weight and now weighs 43 Kilos (94.6 lbs). I gave her the messages from friends and supporters as much as I could. I thought I may be able to convince her to break her hunger strike by giving her these messages. She said, “If I hadn’t gone on a hunger strike they (the regime) had further plans for my family. Fabricating a case for a twelve year old child, just because of her mother is something I just can not digest.” Says she, who has worked a lifetime defending children’s rights. 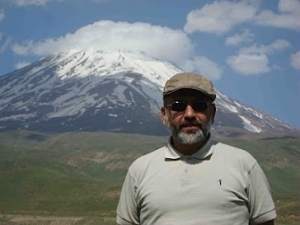 After more than three months in the Intelligence Ministry’s detention in Tabriz, the 21 Sarand camp earthquake volunteer aid workers have been summoned by the Revolutionary Court to go on trial. Their trial, on charges of participating in collusion and conspiracy to commit crimes against the national security, participating in threats against public health, and participation in defiance of police officers orders, will be on Monday November 19, 2012. Previously, the Judicial and police officials had announced the charges for these aid workers as propagating Baha’isim and Wahhabism, spying for foreign media, and distribution of spoiled food items. One of the defendants in this case, Navid Khanjani, is currently incarcerated in Rejaei Shahr prison in Karaj and will be taken to Tabriz for the trial. According to the defense attorneys, the main defendant in this case is Hossein Ronaghi Maleki, a human rights activist who was a volunteer aid worker at the earthquake-stricken areas, while he was out on bail on medical furlough. While incarcerated rights attorney Nasrin Sotoudeh was allowed a prison visit with her children on Monday, today, her family was denied a visit with her. According to the Green Voice of Freedom, Nasrin’s husband, Reza Khandan was not permitted to accompany his children during their visit Monday with their mother. According to a post on Reza Khandan’s Facebook, he went to Evin today but was not permitted to visit her. Nasrin was transferred to solitary confinement 15 days ago. “Today, Thursday, for the second week in a row I went to Evin attempting to visit my wife. Thursdays are visiting days for the prisoners incarcerated in Ward 209. Despite the fact that Nasrin was transferred to this ward 15 days ago, they claim she is not their prisoner. Despite the fact that none of the people in charge of that ward (Evin Ward 209) will admit that she is in their custody, Evin prison authorities claim that Nasrin is in the custody of Ward 209. Despite the fact that it is now evident that no official visitation banning order has been issued for her, they continue to bar her from visits. They no longer even adhere to their own made-up rules and do everything they can to put additional pressure on the prisoners’ families and show no hesitation in this regard. Nasrin Sotoudeh’s Husband: I Urge The Authorities To Move Her To The General Ward, Before It’s Too Late. 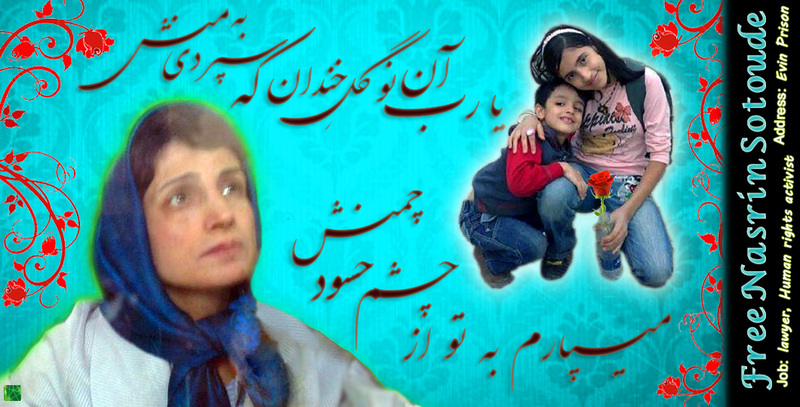 Incarcerated Rights Attorney Nasrin Sotoudeh was granted a short visit with her children on Monday. However, her husband was not granted permission to accompany the children for this visit. Reza Khandan, Nasring’s husband gave an interview on Sunday to Jaras news site voicing his concern regarding Nasrin being incarcerated in solitary confinement while on a hunger strike. Mr. Khandan did you have a visit with Mrs. Sotoudeh today? Despite an approval letter from the Prosecutor, why do you think they did that? “I really don’t know, they never give us any reason. When was the last time you were able to visit your wife? “Of course, my intention on Monday last week was not just to visit her. I had asked the officials to allow me to see her so I could perhaps convince her to halt her hunger strike. I have no more information or news about her since that date. I only know that the prison officials went to the general ward (Ward 350), collected from the cellmates a book, prescription glasses, and a heating pad, and gave them to her. What was her physical condition? “You can’t even imagine how weak she had become. She was weak prior to launching the hunger strike and her condition is now even worse. Her condition is extremely worrisome. The fact that they didn’t bring her for a visit today, shows that she is probably not in a good condition, was perhaps in the clinic, or her condition was so dire that the officials deemed our visit should not take place. How long has it been since your wife was transferred to Ward 209 Solitary Confinement? “Since Sunday last week when they “Illegally” transferred my wife to Ward 209 (under the control of the Intelligence Ministry). This section is for newly arrested people who are going under interrogation and investigation. My wife is serving her sentence. So transferring her to this Ward is illegal. In addition, they have illegally denied her visitation rights. Do you know if the messages from various political and civil activists urging her to halt her hunger strike have reached her? Do you think the officials have told her that the other female political prisoners have halted their hunger strike? “Certainly she does not know. Even if the officials have told her about them ending their hunger strike, she does not trust them and will not believe them. She will not believe this news until she hears it from her own family. If they allow you to visit her and tell her that the other women political prisoners have halted their hunger strike, and tell her of all the others urging her to halt her strike, do you think she will? “I do hope they grant us a visit so I can inform her of all of these and try to convince her to halt her hunger strike. Of course my wife wants these cases to be closed. She is especially upset about the case of our daughter. Well, when a prisoner who is on a hunger strike in the general ward, and encounters health problems, in an emergency case, their cellmates can inform the authorities. Then if necessary, the prisoner be taken to the medical clinic. Unfortunately, Nasrin is in Ward 209 solitary confinement, and only very few times this has occurred (taking her to the clinic). If Nasrin was in the general ward with the other female political prisoners, they could have tried to convince her to break her hunger strike, or even messages from others could reach her urging her to stop her hunger strike. 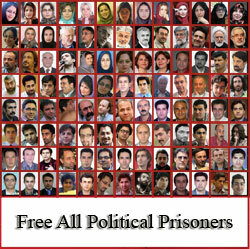 Dr. Mehdi Khazali was re-arrested on October 30, 2012 in a raid of the Pen Society meeting. Dr. Khazali, an Ophthalmologist, author and regime critic, has been arrested six times before. On his last arrest he launched a hunger strike that lasted more than seventy days. Unfortunately the officers did not allow his family to see his body prior to burial. Only for a few minutes after they placed the body in the grave, they removed the shroud from his face. According to this witness Beheshti’s face was bruised and head showed visible signs of severe injuries that they had tried to cover-up with plaster. The severity of the assault and battery that Beheshti suffered was very visible on his body and was observed during the ritual cleansing bath of his body. 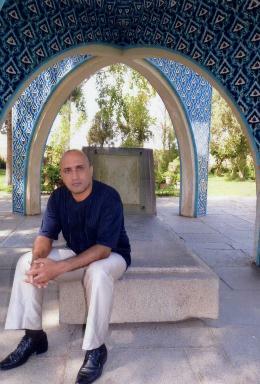 According to Saham News, Sattar Beheshti was buried at the Shrine of Mohammad Taghi in Robat Karim, section 7, row 3, grave number 11. Also, despite threats from officials, a memorial ceremony is scheduled for 2:00 p.m. on Friday at his grave site at the Shrine of Mohammad Taghi in Robat Karim . In the last few days, the officials have been threatening the family not to hold any memorial services for this Green activist. According to Saham News, a large number of agents were present in various locations at the Shrine of Mohammad Taghi during the burial services. They were video taping the crowd and, in some cases, confronting the people who were speaking on their cell phones. Also, there are reports that a large number of agents are present in the neighborhood were Sattar lived. They have also removed and collected all the banners and posters relating to Sattar’s death and memorial services. All contact with Beheshti’s family have been cut off. Saham News also reports that during a phone interview yesterday with Sattar Beheshti’s sister, agents entered her home and handcuffed her and the phone line was disconnected. They detained Sahar Beheshti for a while and warned her not to speak with the media. According to eye witnesses, yesterday when Sattar’s brother-in-law went to collect his body from the medical examiner’s office, the agents confiscated his cell phone and, each time a reporter called, they pretended to be him, telling the reporters that Sattar is alive and is in a hospital.